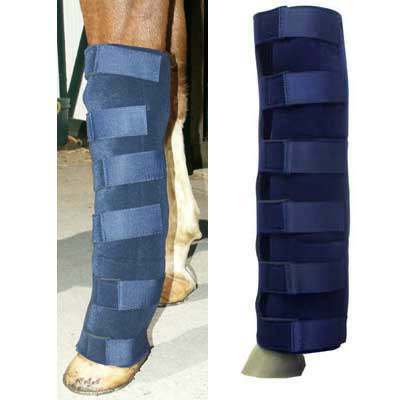 Our Horse Ice Boots are an extraordinary paier of horse boots that will provide maximum comfort for your horse. These top quality and durable nine pocket ice boots feature soft loop material over neoprene. These boots are designed to prevent heat & swelling, as well as create therapy for damaged areas. Six seven inch velcro tabs hold the boot in place, while nine elastic pockets can hold the neccesary ice. We strive to offer the lowest prices for our quality products and your complete satisfaction is our number one priority here at Horse Tack Now. These horse Ice boots stand at 22'' tall and 15'' wide when open. Pockets measure 4 1/4''x7 1/2''. This item is available in color Navy.